"They fight to get out." 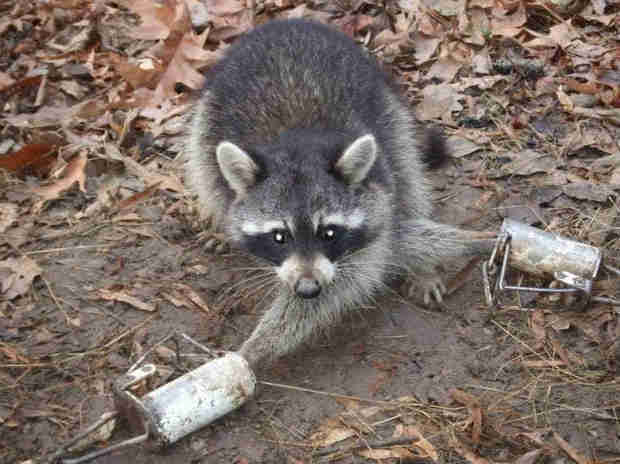 People are putting marshmallows into steel traps to trap raccoons - and it's totally legal. Last year, foothold traps like these were made legal in New Jersey after a 30-year-long ban was overturned. 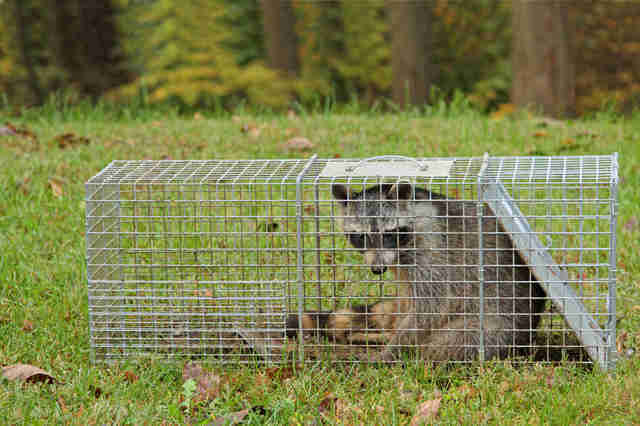 The traps function in this way: An animal puts his paw inside the enclosed trap, which should not exceed 2 inches in diameter, according to state guidelines. By trying to pull on the bait inside, a spring is triggered, closing the trap on the animal's leg. Animals will sometimes wait days before they are found and killed. "There's no way you can modify a leghold trap in a way that won't cause extreme trauma to the animal," Cathy Liss, president the Animal Welfare Institute, told The Dodo. "You have a device that is slamming onto the animal's limb, and it's going to hold them in a vice-like grip, severely restricting or cutting off circulation. They fight to get out. Raccoons sometimes try to chew off their own limbs to get out. That just tells you how bad it is." Liss added that trappers call the new models of the traps "foothold" traps instead of "leghold" traps, the traditional name, to make them sound better. "[It's] just semantic games," she said. "We view that as ludicrous." Proponents of the traps claim that newer models are less likely to accidentally harm pets, and that they're more humane toward the animals they're meant to trap. Lawrence Hajna, a spokesman for the the New Jersey Department of Environmental Protection (NJDEP), which oversees the Division of Fish and Wildlife, said there's "a big difference" between traditional leghold traps and the foothold traps, which are enclosed and tend to be smaller. "One of the key differences are the foothold traps are very selective," Hajna told The Dodo. "The only animal that has the dexterity and long enough leg is raccoons and in some cases, skunks and opossums. Beavers, bobcats, cats and dogs cannot trigger this trap." But both Liss and Jennifer Place, a program associate at Born Free USA, said it's unlikely that trappers would report finding a pet caught in the trap, especially given the controversy surrounding the use of traps. "Trappers generally don't want to volunteer that information," Place told The Dodo. So why was the ban overturned? The New Jersey Fur Harvesters, an association of trappers, requested that the ban be challenged in court - and the group won. Last week, animal welfare advocates tried to reverse that decision in the state's Superior Court, but failed - even though the traps are abolished in more than 100 other countries in the world "I work with trappers in other countries to make their methods more humane," Liss said. "They turn to me and say [about U.S. trapping] 'You guys are in the dark ages.'" On Friday, New Jersey Senator Raymond Lesniak introduced a bill aiming to reinstate the ban. "I'm hoping it moves swiftly through both houses and is signed by Governor Christie," Lesniak, who also fought against the recent New Jersey black bear hunt, told The Dodo about his bill. "If vetoed, we will override!" In the court's ruling, which has been criticized by animal welfare advocates, it said that the "new leghold trapping systems ... do not operate as 'jaws,' having only one part that moves to ensnare the animal when the animal pulls on a lever with its paw, requiring a level of manual dexterity not available to other species such as dogs." Liss said the closed traps might reduce the number of dogs who can get hurt, but "certainly, cats are more dexterous and behave in a way like raccoons do." But, putting aside concerns about pets, is trapping wild animals this way humane, or even necessary? Hajna said these traps have been thoroughly studied by various wildlife agencies and are in use in many states. But Liss said the studies purporting to find the traps humane aren't properly peer-reviewed and are pseudoscience at best. "Raccoons are, in New Jersey, the primary carriers of rabies," Hajna said. 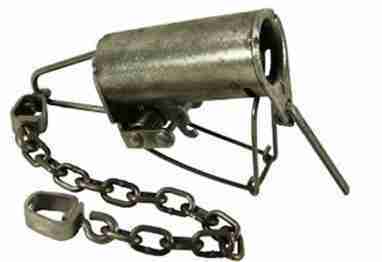 "The trapping provides a management tool. Without some sort of control any animal will expand and its populations will grow and that increases the risk to ecological balance, as well as public safety." Place pointed out that for more than 30 years the state has been able to successfully manage opossums and raccoons in other ways. "The rabies concern seems like a pretty trumped up claim," she said. Hajna also pointed out that there are parts of the state where trapping is a strong tradition that people depend on for income. "There are people who make their living trapping," he said. But 78 percent of trappers say trapping is has not been an important source of income over the past three years, according to a 2015 report conducted for the pro-trapping Association of Fish and Wildlife Agencies by Responsive Management. And 69 percent of New Jersey voters said they believe these traps are inhumane. Historically, trapping also lead to the near extinction of the American beaver, Place pointed out. "This is the history we have to deal with," she said Trapping season will begin in New Jersey on November 15. To support a ban on these traps, you can submit a letter here. The New Jersey Fur Harvesters did not immediately reply to The Dodo's request for comment.